Oh this confirms my worst possible fears! My heart is torn apart to think that by wanting to adopt a Chinese child into our (Chinese) family, that we are unwittingly promoting the abduction (from loving parents, I assume!) and the selling of children. The scale is much larger than I had imagined. We are many months away from our referral - there is still time to change our minds, I guess. When we first started this journey we were so naive, thinking that adoption was the best solution for a needy child as well as for us. Win-win situation, right?? However, it has been my opinion all along that the USD3000 CASH "donation" is a serious temptation for the unscrupulous. The CCAA could make things harder for the criminals and make progress towards reassuring prospective parents that things are "above board", simply by implementing measures that account for the cash that is given (receipts issued, money orders instead of cash - something traceable once it leaves the "donor's" hands...) Is this even possible? Or do you think this would make a difference, Brian? Are there any solutions? Thanks so very much for your hard work, Brian, and for providing this translation. I am looking forward to the next installments. Although there was no evidence that any of the children in the Hunan case were abducted (kidnapped), it is nevertheless interesting that the traffickers contemplated it as a way to obtain children. 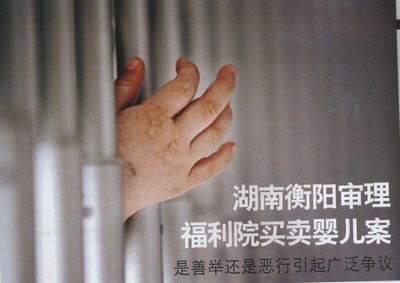 For me, the Hunan story is not about the trafficking of children. I personally have no strong moral objections to birth families willingly reliquishing their children to individuals who then transport them to orphanages. It is not a perfect world, and I understand the pressures placed on birth parents. For me, the primary cause for concern in the Hunan story was the creation of a market for these children, one that possible absorbed children that would not have been abandoned otherwise. The reality is that many birth parents in China, when faced with an unwated child, would keep that child out of moral reasons. But if they heard that the orphanage was BUYING unwanted children, this would certainly have an impact on teh decision, and no doubt this resulted in more children being reliquished by their birth parents. For me, that is the crime here -- the creation of an extraordinary market for children that I believe resulted in children being given up that otherwise would not have been. There are solutions, none of which China will impliment. 1) I believe each child adopted from China should have, as part of their adoption paperwork, a copy of the police report detailing the circumstances of the finding. Date, time and finder should be spelled out. This would allow the orphanage, the CCAA, or the adoptive family access to the original finder. In this way it would be very difficult for orphanage directors, traffickers, etc. to fabricate abandonment statements like they did in Hunan. 2) Allow the press in China to investigate and make aware cases of abuse. The other problem on which the Hunan story sheds light is the overwhelming evidence that there is a declining number of healthy children being found, and this is putting considerable pressure on orphanage directors to increase their cash-flows. Caring for SN children is terribly expensive, and for the orphanages the primary source of funding is the international adoption program. Thus, international families can do the most good by adopting SN children rather than healthy children (keeping in mind that SN encompasses a very wide spectrum of children, from those with scars, cleft lips, extra fingers, to those with more serious needs). Thank you, Brian, for all the information you bring to us. 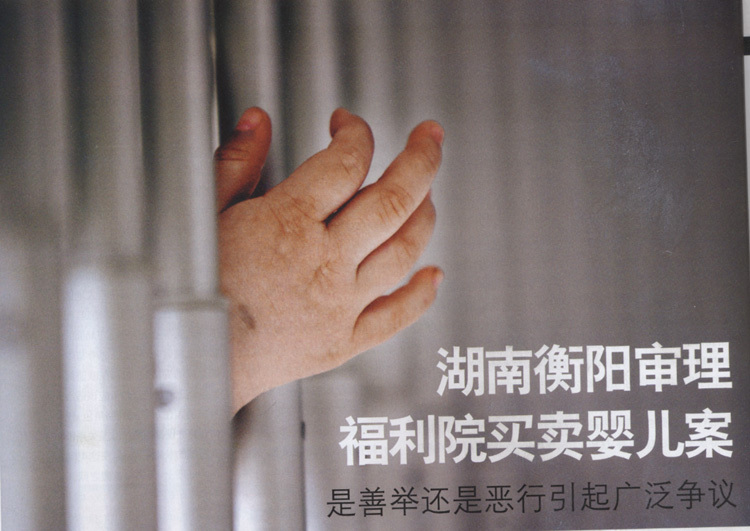 As a mom of a Hengshan baby adopted in 2001, the idea of trafficking sends chills up my spine. At the same time, all of this must be kept in perspective. There is no way that we will ever know if our children were truly abandoned or if they were victims of trafficking. It's very important information and yet, it gives me a feeling of helplessness in that there is no way for us to verify if any of our daughters/sons were actually abandoned. There doesn't seem that there is much we can do about it, but it is very disturbing all the same. Keep up the great work Brian, I look forward to your blog entries. "China began foreign adoption in 1996"
Well, K, obviously I did not write the article. That said, although adoptions began in 1991, it took until 1995 for adoptions to reach 1,000 to the U.S. Since most orphanages did not participate in the program back then, it is certainly possible that the writer, living inside China, may have been told the program started in 1996. Was it a benevolent act or a crime? Perhaps both. While I understand that, legally, Yuan Baishun has to cover the bases and may argue that accepting even abducted babies may not be in violation of Chinese law, I personally would find that unspeakably reprehensible. (And I would find it very surprising if it weren't illegal, but I am ignorant of Chinese law. I just know that attorneys have to argue every angle they have at their disposal.) However, if parents thought it safer for their babies to use a broker to ensure the babies arrived safely in an SWI instead of leaving them on a sidewalk somewhere, I cannot blame them or the people who helped them. Yes, abandoning babies is a crime in China, and anyone helping these poor parents would then become accessories to the crime even as they may have been doing it with the best of intentions for the parents and/or the babies involved. I imagine some charged parents to cover the risks they had to take in this matter. Did they make money off the parents? Did they instead make money from the SWIs? Were they covering their expenses or profiting? What were their motives? I don't like to think anyone pressured parents to give up their babies and I can't fathom abducting babies, but if the abandonment was initiated by the parents, I cannot really fault people who helped and were not personally enriched in any meaningful way in the process. Let me put it in another context. Escaping slavery was a crime at one point in our history, but I could say helping slaves escape capture was both benevolent AND a crime (although not beneficial to the slaveholders and possibly to the southern economy as a whole). I'm not clear on how much the individual SWIs knew (apart from the Hunan officials) and how much they could blow the whistle on their superiors even if they knew what was going on. Perhaps they just felt they needed to find as many homes for these children as possible, regardless of how they came to them. Perhaps they thought foreign donations helped the babies at their SWIs as a whole. Perhaps they were kept in the dark and made fall guys. I don't know. The more I read, the more confused I am. I am glad the Chinese government looked into the matter, and I pray no innocent person got caught up in the scandal. I just doubt the veracity of the judicial system in China and wonder if some higher ups perhaps got away with wrongdoing while some lower level workers took the fall. At least the "show" will perhaps discourage more corruption in the system. It seems some loving people, willing to share their life with a child are unwittingly fueling a trade in children. Without a market, there would be no trade. Well...I adopted my daughter from Hunan in August of 2005. I got home to receive a letter in November telling me about this. I have no way to find out the true story of my daughter's relinquishment. All I have is my faith in God that she is with me as she is meant to be. I received a letter in Nov. of 2005 telling me that my agency would support me in this time ...I to this day do not know what is true..